Witamy! Brrrrr! It’s still cold in many parts of the world so preparing delicious, stick-to-your-ribs comfort food is a top dinner choice for many cooks. One-pot meals are especially appreciated because they don’t have to take a lot of prep time and can be left alone while cooking. This is especially true of dishes that can be prepared in a slow cooker or crock pot. We love one-pot meals because the left-over’s can be reheated a couple of times and often taste better over time. That’s because the ingredients have more time to infuse into the whole dish. 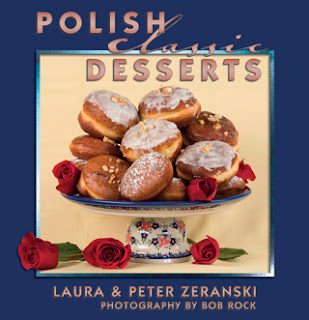 Students of classic Polish cuisine will know that many Polish dishes evolved from recipes first popularized in near-by countries. That occurred for two main reasons -- first was the inter-marriages of nobility from neighboring countries, dating as far back as the 14th century. The second reason has to do with Poland’s long history of changing borders. During the last 100 years or so, Poland’s land mass was claimed and occupied by several countries such as Germany and Russia. The result was an integration of cultures, customs and food that took hold over time. Here is an economical and tasty one-pot dish that borrows heavily from its Hungarian roots yet still retains a Polish spin through the inclusion of caraway. It's actually better if made a day early and reheated, but that takes patience. (The dish actually tastes much better than the photo looks.) Smacznego! Sauté the bacon until transparent. Add onions and sauté until golden. Add the paprika, caraway seeds and garlic. Mix well. Transfer to a pot, add the water, meat, peppers. Cover tightly and simmer for one hour. Taste the liquid and add more paprika and caraway if desired. (We happen to like bolder flavors and usually add more flavorings than most recipes call for.) Add the sauerkraut and simmer for one more hour. Taste again. Let cool, refrigerate overnight. Before serving, add the cooked rice, bring to a low boil while stirring. Remove from the heat. Stir in the sour cream. 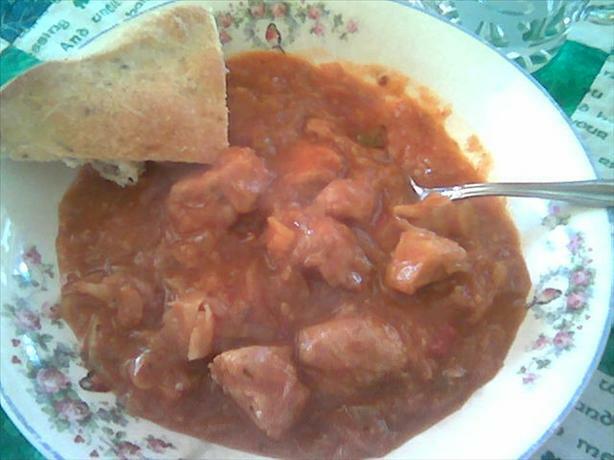 Serve in large bowls with crusty bread, sweet butter, and your favorite adult beverage.